If you are building a second story modular addition, you are most likely doing it to create more living space rather than a separate living unit. The general contractor will turn your one-story into a two-story by removing the roof from your home and immediately setting the new modular second story with its own built-in roof on top. The speed of modular construction is a tremendous benefit when building a second story addition, since the addition can be set in place within hours after the roof is removed from your existing home. Once the modular addition is in place, the inside of your home is protected from a sudden storm. A site builder cannot realistically protect your home as quickly. Another advantage is that the second story can be finished faster. This means your family can use the upstairs more quickly, even if it must wait to enjoy the downstairs until the remodeling is completed. There are two conditions that must be met before you can build a second story modular addition. First, the exterior dimensions of the existing home must be compatible with one of the modular manufacturer’s production sizes. If your home is too wide, a modular will not easily work. If your home has multiple bump-outs, a modular might work, but it may be impractical and expensive. A home can be up to 3-feet narrower than a module, however, and adding a wider second floor can create an attractive, cantilevered garrison colonial look. The second condition is having an existing home and foundation that are structurally capable of carrying the additional weight, which is substantial. You will need to hire a structural engineer to make this determination. He may give you specific instructions on fortifying the structure or the foundation, which might be unacceptable or too expensive. If you decide to carry out his instructions, the GC will complete them as part of his remodeling. 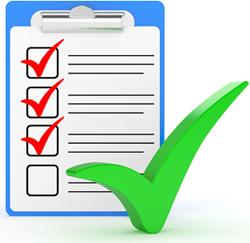 Before the engineer completes his final written report, he will need to see plans of exactly what you are building and receive detailed information from the manufacturer. 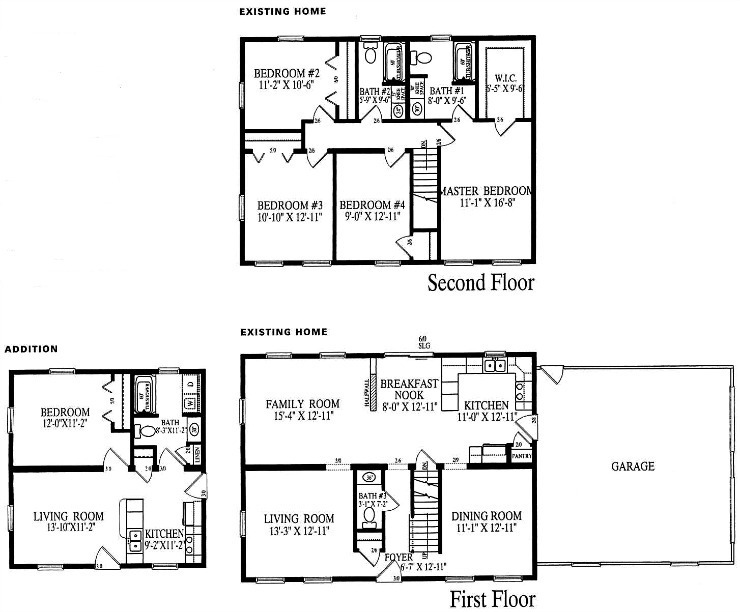 When designing an addition, you must decide where the stairs to the second floor will be located. You must also determine a location for a chase from the basement to the second floor to carry the electrical wires, HVAC supply and return ducts or pipes, and plumbing pipes for second-floor bathrooms. If the GC is connecting to a forced-air system in the basement, the chase must be larger, since the ducts will take up more space than hot-water lines. Second Story modular additions can make ranches look like brand new homes. 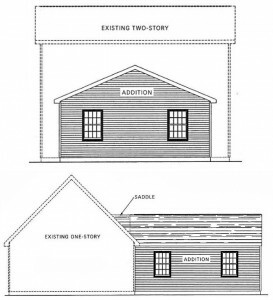 The design of the second story elevation must be coordinated with the first-story elevation. The window locations on the second story should be arranged in a pleasing fashion. This decision should be made early in the design process, since the location of the interior partition walls on the second story must be coordinated with the window locations (you cannot put a wall in the middle of a window). In addition, the window style and sizes should be matched as closely as possible to the existing home. The exterior elevation of all four sides of the finished home must take into consideration any first-story bump-outs or structures. For example, the location of an existing bay window, porch, sunroom, portico, recessed entry, or garage can pose special design challenges. The second story must be planned so that it does not affect either the function or aesthetic appeal of these structures. In some cases, it might be necessary to remove a part of the bump-out or attached structure, such as a garage roof, before installing the second story. If the modular second story will be cantilevered, the overhang can pose additional problems with a first-floor bump-out, such as a bay window. The exterior siding on the second story must fit with the siding on the first story. Otherwise, the siding on the first story will have to be replaced. If you currently have wood siding, you might need to repaint or restain it to create a color match. Similar coordination issues arise for shutters and other exterior trim details. If you have a chimney on your existing one-story home, you will need to make it taller to reach above the roof of the second floor. In addition, all trees overhanging the first story will need to be removed. The actual removal of the existing roof as well as any other materials you are replacing in your existing home, such as the siding or windows, will be a task unto itself. The cost of disposing of these materials will be appreciable. Most importantly, when you are done building your second story modular addition, it will almost feel like you have just built a brand new home. For more information about building second story modular additions, see Building a Modular Addition in my book The Modular Home. Attached modular additions are sometimes built to create a separate, additional living unit and sometimes to create more living space. Most zoning boards consider any addition with a separate kitchen to constitute a separate living unit, which requires that the wall between the two units must serve as a “fire stop.” The easiest way to accomplish this is to have the modular manufacturer build a fire-rated wall on that side of the addition. To qualify as an addition, your community’s zoning regulations will require that it be connected to your home. Detached additions are almost always disallowed. You can connect the two by attaching the addition directly to your home or by joining the addition and your home to another room in between, such as a small site-built mudroom or large, modular great room. 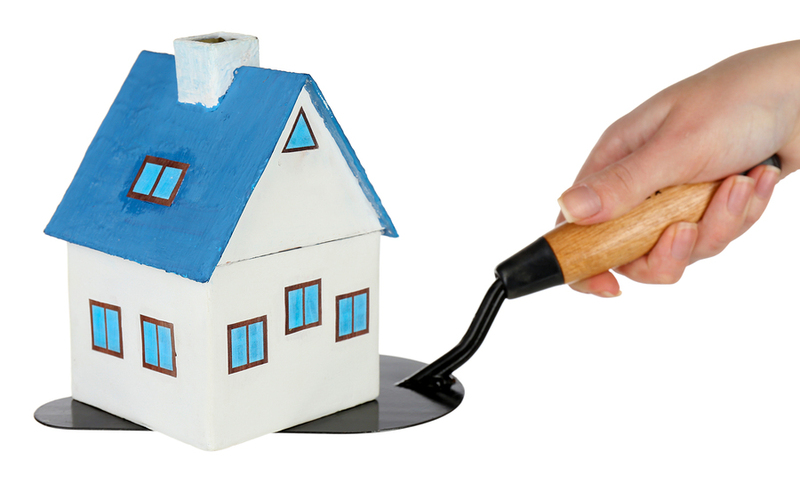 Your property’s topography may limit where you can build an attached addition. If one side of your lot is wetlands or contains a septic system or municipal sewer pipe, you might not be able to build on that side. You will have the same problem, although to a lesser extent, if one side of your land has a steep slope or an outcropping of rock. Although you will want to locate the addition so that the floor plans of your home and addition work well together, you may want to consider an alternative if the preferred location would incur substantial additional expenses. The modular manufacturer will want to take into account whether the proposed attached modular addition will impose structural loads on the existing house or whether the existing house will impose structural loads on the proposed addition. In designing a modular addition, the dealer and GC should make sure that the intersecting roofs shed water and snow properly. This is particularly important when the addition is being built in areas with the potential for heavy winter snow, because the roof of the addition needs to be attached to the existing home so that the two can carry the load together. Depending on how and where the modular addition will be attached, the manufacturer may ask you to hire a structural engineer to determine what needs to be done to make the two structures work together. The engineer may require the GC to beef up the existing roof to carry the additional load. The windows on the left side of the living room and family room in the existing home will have to be removed, and a new opening will need to be added in the living room to receive the door to the attached modular addition’s kitchen. The two left side windows on the second floor on the existing home will also need to be moved if the roof pitch on the addition is steep. Before your modular addition is built, the GC must measure exactly where the openings into your existing home are located. The modular dealer will then use that information to line up the connecting openings in your addition. If you are attaching a modular addition directly to the existing home, the GC will need to remove the siding on the existing home’s wall. Any windows or doors on that wall will also need to be removed, and the resulting holes will need to be closed off and finished so they match the home. No matter how well the addition is set alongside the existing home, there are bound to be small gaps between the two. The GC will need to tie the two buildings together on the inside and outside to hide any gaps. Next week I’ll discuss the second-story modular additions. 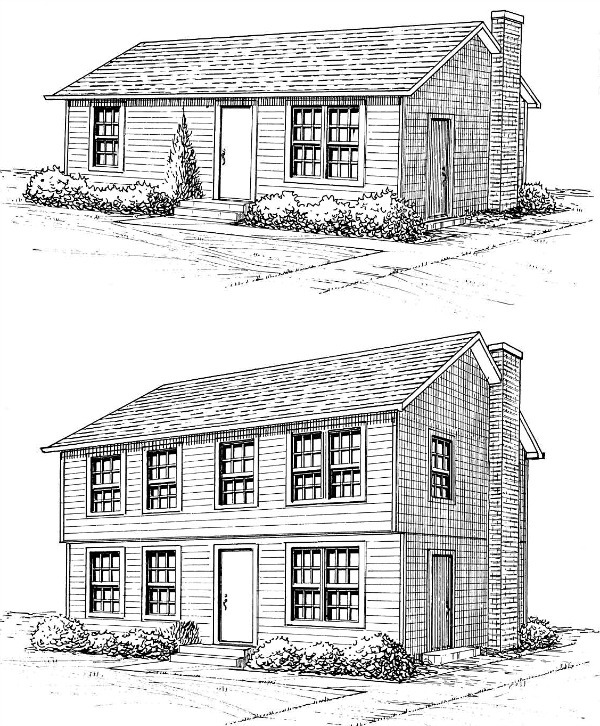 For more information about building modular additions, see Building a Modular Addition in my book The Modular Home. When building a modular home, it is recommended that you hire a general contractor (GC) with modular-construction experience. In some respects, this advice is even more important when building modular home additions. There are usually a number of surprises when building an addition, regardless of the type of construction. Most of them derive from the fact that you are connecting a new structure to an existing structure that was not specifically designed to accept it. Surprises are typically more frequent and complex with an older existing home. Construction surprises almost always cost money and time, and they can cause personal stress, especially if you remain in your home throughout the project. The best way to manage the challenges of building an addition is to have a professional GC directing the activities. If you are able to build a modular home addition, you will need to work with each of your dealer candidates to determine a floor plan, specifications, and price. The steps will be essentially the same as for building a single-family modular home, except that you will probably need at least one of the dealers to help you create a custom plan. Although most manufacturers build additions, few offer standard plans that were created specifically for this purpose. Many standard modular house plans, however, can do double duty as modular home additions. For example, small ranches can serve as in-law apartments, and the second story of an appropriately sized two-story can work as a second-story addition. I recommend that you provide prospective dealers with photographs and approximate measurements of the inside and outside of your home. This will help them create a design that meets your needs and fits your existing home. When you sense that a particular dealer can help you, invite him to see your home and take his own measurements. Take similar steps with your GC candidates. Once you have confidence in a candidate, invite him to visit your home to make sure he can do what you and your dealer are proposing; he should also take his own measurements. He can then finalize what he needs to do to build the addition and present you with a price for his services. Add his price to your dealer’s price and decide if the project can meet your budget. The GC tasks for modular home additions will be similar to those in building a new modular home. These tasks include completing the site work, foundation, plumbing, electrical, heating, and interior and exterior carpentry. The GC will need to build any site-built structures you need, such as a deck. He will also be responsible for completing some construction tasks that are unique to building an addition, which will be discussed in the following sections. If your existing home has a septic system, you must obtain approval from the local board of health to use your current system with your modular home addition. The determining factors usually are whether your new combined home will have more bedrooms than your existing home and if the septic system was designed to accommodate them. Without the approval, you will not receive a building permit to go forward. The board might give its approval only if you first enlarge or replace the existing system. Even if the system is adequate as is, connecting to it can create some additional expenses. For example, if your addition has a new bathroom and its waste pipe is below the line connecting to the septic or sewer system, you will need a pump. You should expect that part of your lawn and landscaping will be disturbed by the excavation work. You can preserve some of your shrubbery by relocating it before the construction begins. If you have a paved driveway, it might suffer some damage as well. If any utility wires are in the way, the GC should arrange for their temporary relocation before work begins. Since utility companies often require a few weeks’ notice, this must be scheduled in advance. In addition, other items attached to your home that may affect the construction of the modular home addition, such as a TV antenna, will be need to be taken down before work is begun and then reinstalled after the addition is complete. 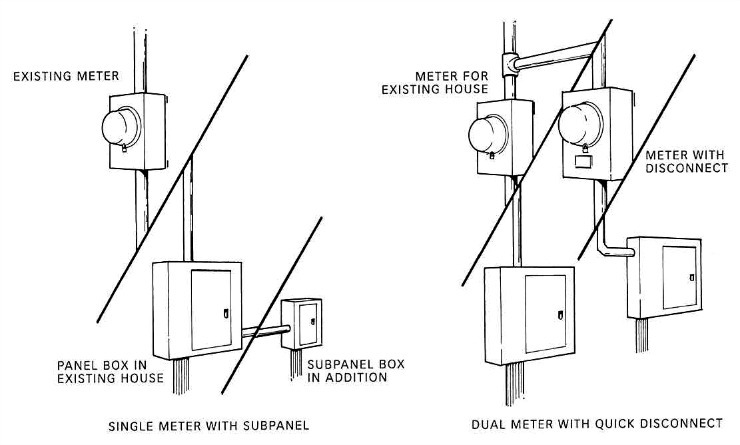 When building modular home additions the electrician can use the existing electrical meter or add a second meter when connecting the addition to the electrical service. The electrical service to your home might need to be upgraded, especially if you have an older home with a 60- or 100-amp service. The location of the electrical panel box will influence the amount of work the GC needs to do to connect to the modular home addition. If it is on the opposite side of the home, it will cost more to make the connection. To be safe, the GC should instruct the modular manufacturer to make each electrical run long enough to reach the panel box. Another option is to use a junction box or subpanel. If you are building the modular home addition as a separate apartment, you may want to install a separate electrical service, so that the occupants will receive their own electrical bills. The electrician can do this by installing a dual-meter socket. When building modular home additions the general contractor should connect the smoke detectors in the addition to the smoke detectors in the existing home. The building inspector or fire marshal might require you to upgrade your exisiting home’s smoke detectors. You should do this even if it is not required. Have the GC outfit your existing home with hard-wired detectors, if it does not already have them. Instruct your modular dealer to coil an extra wire in the basement that connects to the smoke detectors in the addition. The electrician can then pull the wire into the existing home to connect the smoke detectors in the existing home to those in the addition. When the two systems are interconnected, a fire in any part of the home will trigger the alarm in all parts, which is exactly what you would want. If the GC intends to tie the modular home addition into your current HVAC system (heating, ventilation, and air conditioning), your boiler or furnace might need to be upgraded to take on the additional demand. You might be able to do this affordably if the heating system is slightly oversized and retains some untapped heating capacity; it is not unusual for contractors to provide more capacity than is actually needed. Otherwise, you will have to consider an entirely new heating unit. This same point holds for central air conditioning. You will only be able to tie into the existing compressor if it has sufficient capacity. You can avoid the expense of replacing the heating system by using electric-baseboard heat in the addition. Putting electric heat in a second-story addition for a home with hot-water or warm-air heat on the first story might even save you money. Since the second story is likely to be made up of bedrooms, you can take advantage of the fact that the temperature in each room can be controlled separately with electric heat. However, if you have central air conditioning on the first floor, you will likely want to extend the ducts into the addition. Electric heat can also work well with a small in-law apartment; its small size will keep the heating cost low. If you have a separate electric meter for the apartment, you and the occupants will be able to identify the exact usage. Another option is to install a separate boiler, furnace, or compressor for the addition. You may want to consider this alternative when your current heating and cooling systems are on the opposite side of the home from the addition and the GC believes the distance will cause too much heat and cooling loss between the unit and addition. You will have similar issues with supplying hot water to the modular home addition as you will have with the heat and air conditioning. Unless you have excess capacity in your current system or want to upgrade, you will need to add a separate water heater for the addition. Next week I’ll discuss attached modular home additions. For more information about building modular home additions, see Building a Modular Addition in my book The Modular Home.